TTP’s Water Treatment Courses cover water makeup fundamental chemistry as well as industrial systems. Industrial Systems featured include Sand Filtration, Clarification, Deareation, Ion Exchange and Reverse Osmosis. 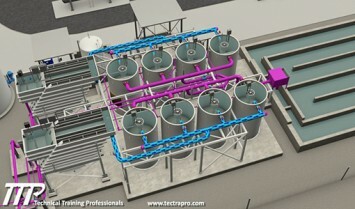 TTP uses 3D illustrations in its water treatment training content to not only show what is occurring with chemical reactions but with internal system flowpaths. Regeneration support equipment as well as flowpaths are all clearly illustrated and explained. TTP water treatment courses include reverse osmosis and ion exchange systems. The courses start at the fundamental level for both types of systems and the upstream support systems that pre-treat the water for use in boilers. The courses include thorough reviews the operation and design of these two typical water treatment systems.